Learn to Write for Results that Sell and Rank! Whether you’re a busy agency owner looking to add content creation to your offer and train your VA’s, or whether you’re a total newbie as a digital marketing agent, you’ll find what you need to understand the goals, framework and process of writing in these over-the-shoulder videos and step-by-step PDFs. Whether you hate to write and haven’t a clue how to start, or you love to write and want to turn your passion into profit — add this training to your marketing toolbox to start creating quality content that sells and ranks on Google. In this 5-day course you will learn the secrets of creating quality content that gets results and ranks using my step-by-step process for digital marketers to write like an expert in any niche or topic. PAY IN FULL — One Payment of $497: Click the button below if you have been an OMG member for more than one year. PAYMENT PLAN — 1st of Two Payments $199: Click the button below if you have been an OMG member for less than one year and agree to pay $199 today, and then pay the balance of $298 after completing one year of OMG membership. PAYMENT PLAN – 2nd of Two Payments $298: Click the button below when you are ready to make your 2nd and final payment of $298. After purchasing, read WHAT TO EXPECT NEXT at the bottom of the page. Build your confidence as a writer with a process that works every time! 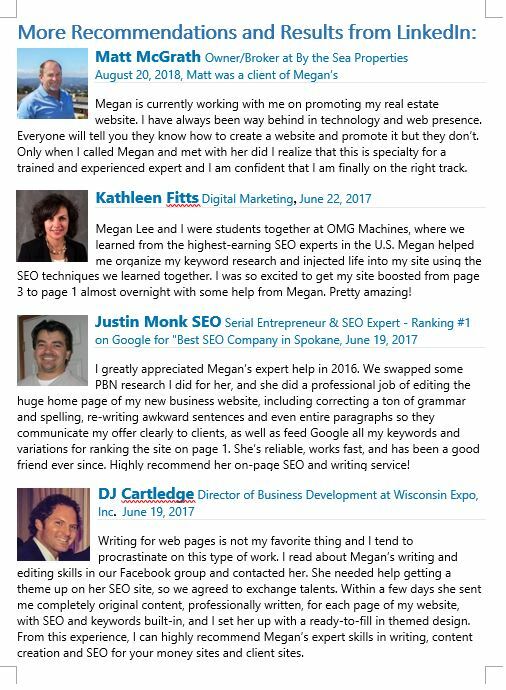 I’d been writing and editing professionally for 30 years and had taught several college writing courses before joining OMG in early 2016 to become an SEO expert. 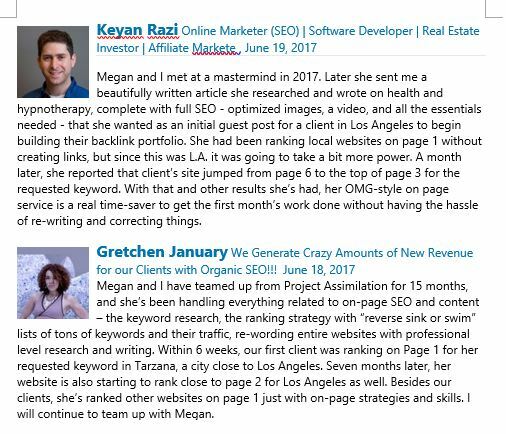 I started ranking my first websites in small to medium-size cities using only quality content writing together with the OMG-style on-page SEO I learned from our coaches. 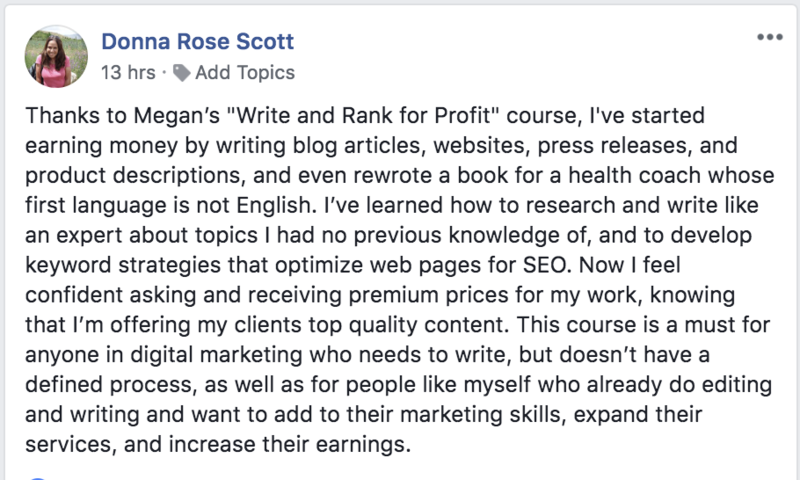 This “Write and Rank for Profit” course came about naturally as I began swapping writing for technical help from other OMG members, and then began helping newer members who were learning SEO, but didn’t know much about writing and couldn’t afford to hire a top copywriter for their own or their first client website. What I teach you in this course is writing for digital marketers. I share how I understand and apply our coaches’ OMG SEO training and David Mills’ LOI concepts specifically to the writing process. This course complements the training from the OMG coaches, and adds to it with my step-by-step guide to content writing that is optimized to boost rankings, lead potential customers to a decision, and that fully supports your off-page SEO strategies. It’s the exact process I use every time I sit down to write content for a client’s home page, blog articles, or any type of sales content, broken down into a step-by-step process with real-life examples, over-the-shoulder videos, and templates, and with the overall framing of writing that gets results in sales and ranking. Writing with On-Page SEO that Gets Results! Before purchasing, please read the full day-by-day course description below. NO REFUNDS WILL BE ISSUED, since the entire video course is available as soon as the purchase is made, and all step-by-step PDFs, examples, templates and transcripts are downloadable. Intro: The course consists of five main sections that will get you writing high quality website content for home pages, blogs, and other sales content like a pro. The course is broken down into five “days” if you are learning and applying it as you go to a writing text. Or, you might choose to binge-watch and read it all in one dedicated weekend, and then start applying the concepts and skills to your marketing content and using the PDF checklists as needed. Day 1 introduces my process of writing web pages, blogs or other digital marketing content for any niche. It covers keyword research in detail to create an RSOS-style Keyword Strategy Page that you can use for both on-page and off-page SEO, and also incorporates David Mills’ formula for writing. Each step has Over-the-Shoulder videos, a fully written out step-by-step PDF, illustrations, sample templates and samples of finished work. Result for today: a comprehensive Keyword Strategy Page that will power up your content now, and is equally good for your back link anchor text later. Day 2 is about researching and understanding your client, their business niche and their ideal clients more deeply and accurately. You will gather ideas for topics to write about from a number of places on the Web, and gather sample content for paragraphs, headings, images and videos. You will record your ideas on an Ideas Page, and paste sample content into a Swipe File Page. By the end of today’s classes you will use these two documents along with your Keyword Strategy Page and your Existing Home Page Content page to create a Content Framework (outline) by organizing your ideas with their main keywords into a title, a list of main topics and their sub-topics. Results for today: A Swipe File full of gathered content from the Web, and a finished Outline for Writing your text full of paragraph ideas you gathered in Days 1 and 2. 2.2 Three Scenarios (16 min.) to “mind-read” your client, his customers and your future successful self with this project. 2.3 Types of Content (17 min.). The many types of content you will gather from the Web for your client, his niche and his customers. 2.4 Content Ideas from your Keyword Strategy Page and from the Client’s Online Properties (25 min. 34 sec.). 2.5 Top Local Competitors and Niche-Related Websites (12 min.). Content gathering. 2.6 Encyclopedic and Niche Authority Sites (17 min.). Content gathering. Day 3 will teach you all the basics of how to write quality content for marketing, sales, and SEO ranking. You will see many details and examples, keyword placement and on-page SEO with header tags, and a strategy that powerfully ranks sites based on adapting Greg’s RSOS technique to content writing. Also you will see examples of applying Fletch and Stephen’s SEO and content teachings, more from David Mill’s formulas for writing sales copy that gets results. You’ll learn how to not over-optimize with a simple KW density check and balance example, how to find and add outbound authority links, and how to proof-read. Today’s classes begin by learning how to edit any existing home page content and add in SEO ranking factors. Next, you will learn how to write the new home page content to add to the existing text. Then you will learn how to organize the content you gathered, rewrite it, add and balance keywords, and proofread. Results for today: You will put together a Rough Draft from your knowledge, research and content gathering; then you will edit and re-write it into a cohesive 2nd Draft, and finally you will proof-read and polish it into a Final Draft for your own website or a client’s home page. 3.2 Editing the Home Page Existing Text – Part 1: Essential On-Page Elements (35 min.) 18 important elements to look for in a web page’s already existing text. 3.3 Editing the Home Page Text – Part 2: Optimize the Page Title, Header Tags and Paragraph Headings (1 hr. 2 min.) The essential elements of well-written headings and titles. 3.4 Editing the Home Page Text – Part 3: Edit and Optimize Existing Paragraphs (35 min.) How to clarify vague text with essential elements, and how to structure a sales page for customer decisions (conversion). 3.5 Writing New Content Part 1: Building Paragraphs into a Rough Draft (1 hr. 21 min.) The key video that pulls it all together to create the first draft of your home page, and demonstrates the Clone Method and the New Idea Method. Step-by-step, this video demonstrates how to transform your Outline of Ideas into a Rough Draft of written content for a home page. 3.6 Writing New Content Part 2: Rewriting Content to be 100% Original (50 min.) How to organize the large paragraphs of text and ideas in your Rough Draft, the three main ways to rewrite the ideas, paragraphs and sentences of borrowed content using Free Writing, the Clone Method, and the Fresh Start Method. Proof-reading from 3 important perspectives. Final checks for spelling, grammar and originality. Your Rough Draft will be shaped and refined into a beautifully written Home Page Text that will convert and rank. 3.7 Keyword Density Check and Balancing the Keywords (29 min.) How to do a final check for keyword density, the four things it reveals, and how to adjust keywords for both safety from over-optimization and for ranking power. Day 4 is about finding legal images, copyright law compliance, geo-tagging, finding legal videos if needed, uploading content to the Media Library, and how to fully optimize images. Results for today: Images and generic video for your home page text or blog article, optimized and uploaded to Media Library ready for placement in the text, or ready to send to your client’s webmaster. Optimizing the Images for the Asheville Real Estate Home Page PDF: Sample of images and their SEO optimizations prepared to send to a webmaster. Research on Optimizing Images with Yoast SEO PDF: Optional information if you want to learn more about this plugin. 4.1 Finding Images and the Creative Commons, Copyright law, and finding free images. Day 5 is all about finishing the content with inner and outbound linking, adding a keyword theme to the site, SEO plug-in use for pages and images, placing the content on a WordPress website, or alternatively, writing clear instructions for lay-out by a webmaster. Also, Day 5 includes videos about client-getting, pricing and Fletch’s invaluable advice about how to scale a content agency. Result for today: Adding final SEO elements and a keyword theme to your home page content, including image and video placement, inner links, SEO plugin optimized for the page and the images, a bit about schema, and creating full instructions for a webmaster, if needed. Also, knowledge shared about client getting, offer fulfillment, pricing, scaling, outsourcing content, etc. Take on Those Writing Jobs for Profit! My main goal is to give you a black-and-white step-by-step PROCESS that you can use, adapt, and apply to any “grey-area” writing task for niches or topics that you may know little or nothing about when starting out, so you can write as an expert. My second goal is to help you build a framework for writing any type of sales and marketing content, and remove any writing blocks you may have previously associated with your ability to write. My hope is that you will begin to truly enjoy the writing process as an added success tool that helps you build your ultimate WIN as a Digital Marketing Agent. As soon as you complete the PayPal transaction, you’ll be redirected to the page where you setup a login profile. From there, you’ll be directed to a Welcome page with full access links to each day of the course. In the background, you’ll receive an email (please check your spam folder) with your login credentials that you just created (or one that reminds you to create a login profile if you didn’t complete registration). In its current version, this training assumes that OMG members have access to the OMG coaches’ full SEO training. 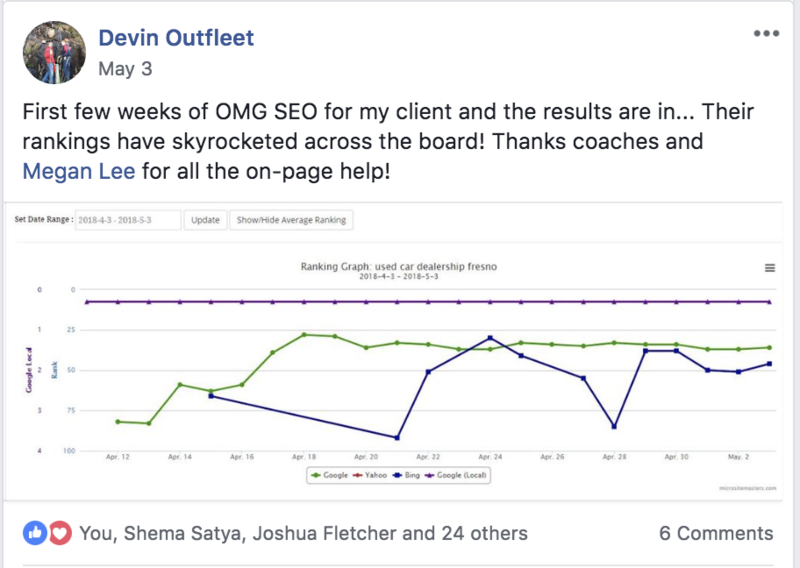 Therefore, anyone outside of OMG membership who wants to purchase this course will do so with the understanding that significant parts of the SEO training referred to, which are taught to OMG members, may be touched on but not fully explained. If the course is revised at a later time to include a fuller training in SEO for non-members, the price of that version will cost significantly more. The two-part Payment Plan is ONLY for OMG members who are still within their first year’s OMG membership payment plan to make it easier for them financially to afford this training while they are starting out and may not yet have clients. 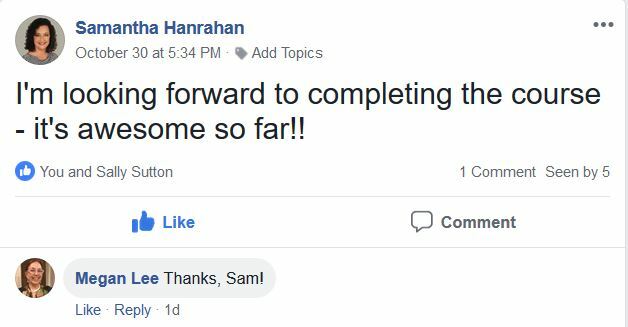 OMG members may, of course, share these training materials with their immediate family members (spouse and children), and develop your own SOPs to train VAs. 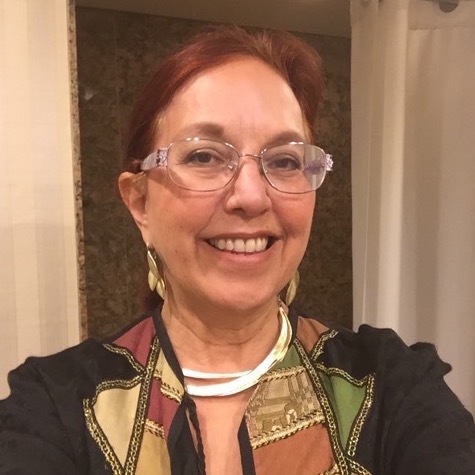 If you are not an OMG member, or if you are a member who wants to purchase it for a VA to take the course, please use the top button to purchase the course for the full price in its current version of $497.